WPForms 1.5.0 is finally here, and I’m really excited about it because it’s one of my favorites. There are several new features in this release that are designed to make using WPForms even easier than it already is … sounds crazy considering WPForms is the most user friendly WordPress form plugin in the market. Our entire focus this release was user experience improvements for you and your visitors. We also added some foundational improvements that will serve as building blocks for our upcoming features in 2019. With that said, let’s take a look at what’s new in WPForms 1.5.0! 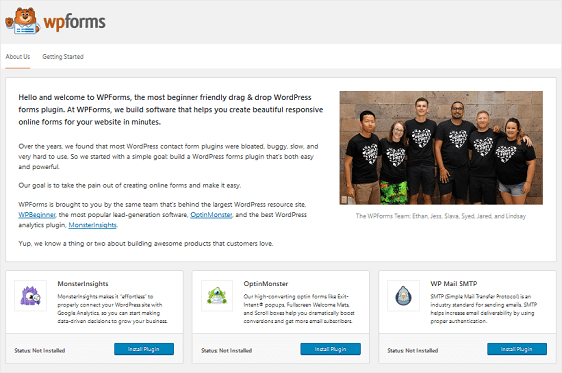 We built WPForms to be the most beginner friendly WordPress form builder in the market. To stay true to our mission, make smart WordPress forms easy, we created an internal challenge called the “WPForms challenge” which basically said users should be able to create a simple form and start collecting entries in less than 5 minutes. Every time we added a new feature, it was my goal to stress-test the user workflow and make sure that we always stay true to our mission. With the rapid growth of WPForms, I know that we simply can’t think of every use-case ourselves. As a team, we decided to make the WPForms challenge public and make it part of our new user onboarding flow as a guided-tour of WPForms. This means that every new user can give us feedback, and the added accountability will allow our team to continue improving the workflow while adding more powerful features. 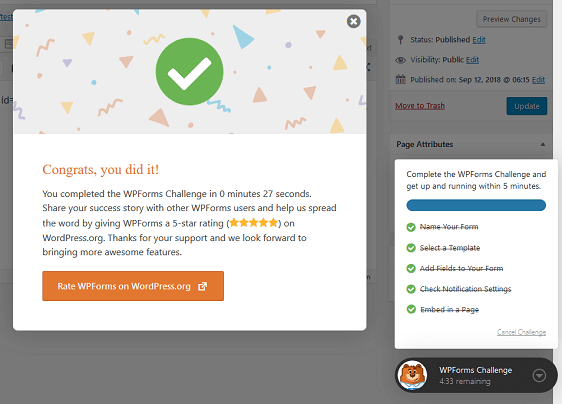 When you first install and activate the WPForms plugin, you will see an option to take the WPForms challenge as part of the onboarding screen. Once you start the WPForms challenge, a guided tour option will appear on the bottom right of your screen with a 5-minute timer and list of steps you need to take to successfully create your first form. It will guide you through each step from naming your form, to choosing a form template, adding form fields, configuring email notifications, and even embedding the form on your website – all in less than five minutes. When you finish in less than 5 minutes, you’ll see a success message with your completion time, and the option to share your success story with others. And if by chance it took longer than 5 minutes for you to finish, then you’ll be presented with a suggestions field, so you can give us feedback and let us know exactly what went wrong. My hope is that the added accountability will help us further improve the product and continue to work towards our mission: make smart WordPress forms easy. Forms are one of the most important aspect of a business website. Thanks to several users, we realized that it required far too many clicks for you to see how well your forms were performing. With the new WPForms Dashboard widget, now you can quickly get a bird’s eye view of your form performance as well as have 1-click access to your most important form’s entries. We added the memory feature to the WPForms graph. If you view a specific form’s entries using the graph icon, then the next time you log into your site, that same view will be there. This allows you to monitor your most important web form without having to click on that form’s graph icon every time you login to your site. The success of your business largely depends on your forms’ performance. Having a quick way to check the status of every form on your website right from your site’s dashboard should make life a lot easier. 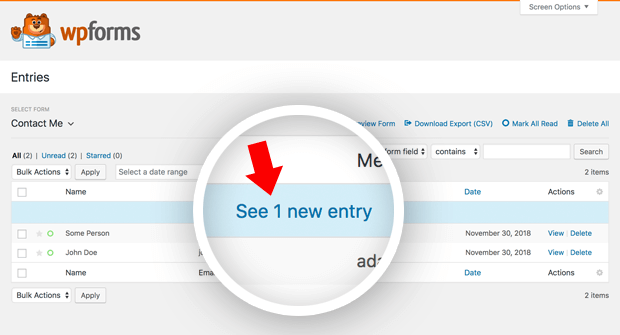 This simple, yet very helpful feature helps you see new form entries while you’re viewing the WPForms Entries page. This has two main benefits. For starters, you can immediately see when new entries have been submitted on your website. But more importantly, the form entry “heart beat” helps you identify email deliverability issues. By default, WPForms automatically sends site owners an email notification whenever a form is submitted on their site. But WordPress is known for not properly sending email notifications. We suggest you take advantage of our WP Mail SMTP plugin to solve this issue right away. One of the most annoying things about online forms is seeing an error after submitting the form and having to fill out everything all over again. This is among the top reasons for form abandonment. Well, we’ve fixed that with Dynamic Field Population. Now users will only have to fix the field that has an error, and everything else will be automatically pre-populated. 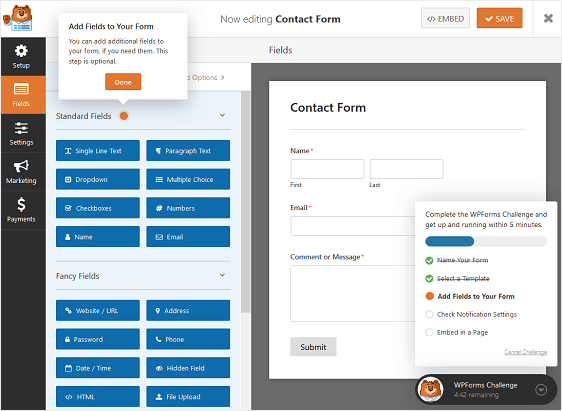 This feature also gives websites owners the ability to enable form field pre-population which should make filling out and submitting forms faster than ever for your users. Having the ability to pre-populate fields was among the most requested features, and we look forward to expanding this functionality in the future release for developers to build upon. By decreasing user frustration and improving the user experience, you can expect an increase in form conversions, sales, and revenue. Our goal for 2019 is to add more personalized elements to boost engagement within the WPForms community. We decided to get a head start on our 2019 goal by adding an About Us menu in the plugin, so you can learn more about the team that works extremely hard to ensure you and your visitors have the best WordPress form experience ever! It’s worth noting that with this release, we will no longer be providing support for PHP 5.2. PHP 5.2 has not been officially supported by PHP foundation since January 6, 2011. This basically means it hasn’t received support, security updates, or fixes in nearly 7 years. If your WordPress hosting company is still using PHP 5.2, then it means they don’t care about your website security. Because we want your form data to be secure and make sure that your website is always fast, we have decided to no longer support PHP 5.2. If you are using PHP 5.2, then WPForms has been displaying a notice in your WordPress dashboard for the last year. If you plan to continue using PHP 5.2, then we recommend not updating to WPForms 1.5 because your forms will stop working. We recommend either asking your web hosting provider to upgrade your PHP version or switch to a different web hosting. We have a step by step guide on how to deal with outdated PHP versions. Lastly, we want you to know that WPForms 1.5.0 also had over 30 minor bug fixes and improvements in the backend of the WPForms plugin, so you can continue to enjoy the best form creation experience. And that’s all we have for you today! We hope that as the year comes to an end, and you begin to make big plans for the next year, that WPForms plays a significant role in your success. Don’t have the WPForms Pro license? Click here to Get Started today and experience why over 1 million websites use WPForms. Beautiful – so good to see you guys head in the direction of even more ease and accountability. And pre-populating fields sounds interesting, ideed. Will it be possible to pre-populate fields of a certain form using URL parameters, too? So i.e. if someone clicks on a certain button, the hidden source field in that form would automatically be populated with the source of that click? Plus – what about ActiveCampaign integration? I look forward for what’s to come. Thanks for doing so great! Thanks, we’re excited about this too! And yes, you can populate fields via URL parameters — we’ve got a developer doc with more details on that here. We don’t currently have plans to create an ActiveCampaign addon, though you can set this up through Zapier in case that helps. Congrats on this release, guys. Looks amazing!